One of the things I love about San Francisco, is that no matter what your day holds, or where you wander in the city you are never more than a few paw prints away from good food. Today’s find came from Hayes Valley while I was shopping at Nancy Boy for some bath products. Their shampoo does wonders for my untamed fur…but I digress, this blog is about food. I was in the mood for something warm and satisfying, so I stopped in at Lers Ros Thai. It was my first time visiting so I didn’t know what to expect. I’m so glad I did, I think I’ve found my new go to Thai place. And there is a location on 16th street just a few blocks from where my doggy palace is located. I wanted to try a couple of dishes, so I ordered the vegetarian Pad Thai and the Pra Ram Pak, a peanut curry dish with vegetables. And for those vegetarians out there, they have an amazing list to choose from, so dig in. 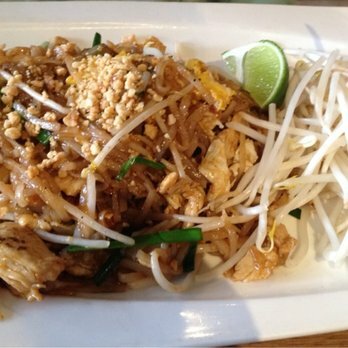 The Pad Thai was warm, with a sweet smokiness that I’ve never experienced before with this dish. The vegetables were cooked to perfection, tender yet still slightly crisp. They were flavorful and fresh. The Pra Ram Pak, was a delicious surprise. Served with white or brown steamed rice, it was tofu and mixed vegetables in this slightly spicy, peanut curry sauce that was out of this world. I was licked my paws trying to get the last drop. It was crazy good. So if you are in Hayes Valley, the Mission, or the Mid-Market area of the city, and you’re in the mood for really good Thai food. Stop by. This place has an extensive menu. I can’t imagine anyone not being able to find something here that suites their taste or dietary requirements.